The INSTALL training program features an ever-evolving curriculum designed to teach foundational basics and keep flooring installers up to date with cutting-edge trends, technologies and techniques. The floorcovering curriculum is developed by the Carpenters International Training Fund with input from industry leaders and manufacturers. Experts regularly review the curriculum to keep it current and make sure it’s the best it can be. We seek input from all stakeholders in the floorcovering industry to make sure our training is unrivaled. More than 100 mills, manufacturers, flooring consultants and associations endorse the INSTALL curriculum. Our Alliance Partners have a vested interest in participating in the INSTALL training program and contributing to its curriculum. Together, we ensure that installers train with the exact products they will use in the field, and receive the knowledge and training that is specific to those products. The content in our training program focuses on floorcovering best practices and stays up to date with emerging trends in flooring. We teach core skills for proper floor preparation, installation and finishing procedures for carpet, resilient flooring, resinous flooring, hardwood flooring, substrate prep, concrete polishing, artificial turf and more. Installation procedures for each of these flooring types, including theory and practice for proper installation, are part of the INSTALL curriculum. INSTALL is part of a training program that spends over $250 million on training each year across 200 training centers in North America. For every hour that a member works, money is contributed to the training fund. There is no additional cost to the contractor or their employers. While many trade training programs take place in hotel meeting rooms or online, our INSTALL training is delivered at scores of state-of-the-art training facilities located throughout North America. These brick-and-mortar facilities give participants an environment that is conducive to learning. In-person training also provides face-to-face interaction with flooring instructors that is key to learning outcomes. INSTALL boasts a group of more than 100 exemplary, veteran flooring instructors who train installers in training centers around the country. These professionally accredited educators keep up to date with all the latest trends, technology and techniques through INSTALL’s extensive “train-the-trainer” program. Our acclaimed floorcovering training program is then delivered across North America through these instructors who set a high bar of excellence among their installer students. INSTALL standards are reviewed on a regular basis by the U.S. Department of Labor and by the labor departments of Canadian provincial governments. We establish standards for fundamental installer skills, skill competence, theoretical knowledge and hands-on skills testing. Our instructors teach skills important in the floorcovering industry. These include floor prep, general hand and power tools, job site check procedures, adhesives, general layout, all installations and much more. 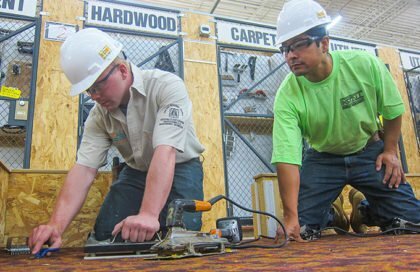 As INSTALL training facilities go, we are especially proud of the Carpenters International Training Center (ITC). The 1 million square foot, state-of-the-art campus is a hub where the United Brotherhood of Carpenters and its working members can deliver skills instruction to installers in the field.